In fact, there are already official agreements about loss and damage in international climate policy. But what does this actually mean? And does it have the same significance for different players? Our new paper, published today in Nature Climate Change, presents the first academic study of stakeholder perspectives on loss and damage. We interviewed 38 experts, including negotiators, practitioners, and researchers, between April and November 2015. These interviews revealed four distinct perspectives, which can help policymakers and practitioners better understand each other as they move forward on implementing international agreements. For many years, vulnerable countries have pushed for loss and damage (L&D) to be tackled as part of the United Nations Framework Convention on Climate Change (UNFCCC). As early as 1991, small island states were calling for an international insurance pool covering residual damage from rising sea levels that couldn’t be prevented by mitigation and adaptation efforts. This is also not the only time that extreme weather has prompted further demands to address L&D. Many will remember the heartfelt plea from a Philippine delegate at the Warsaw climate negotiations following Typhoon Haiyan, which killed more than 6,000 people in 2013. 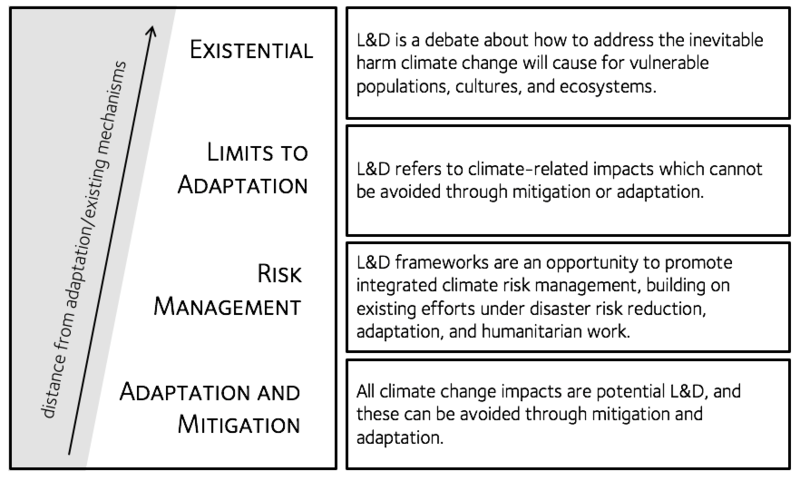 The L&D issue is complex — and sensitive — involving climate impacts and risks for developing countries, which are more vulnerable to the effects of climate change. Despite the challenges, L&D has now entered the formal architecture of the UNFCCC, first with the establishment of the Warsaw International Mechanism in 2013, and later as part of the Paris Agreement in 2015. The role of the Warsaw International Mechanism is to promote the implementation of approaches to addressing L&D associated with the adverse effects of climate change, by enhancing understanding, strengthening dialogue, and enhancing support (financial, technical, and capacity-building). The Paris Agreement explicitly states that this support does not refer to liability or compensation. The language of these documents can be difficult for those outside the policy community to interpret, and some suggest “strategic ambiguity” has been fundamental for reaching agreement. But now, researchers and practitioners are starting to ask how they can help address L&D, and many are confused, particularly about how L&D mechanisms might be distinct from existing approaches to adapt to climate change, and manage disaster risk. So, practically speaking, what does addressing L&D mean? Experts have begun to develop concepts and frameworks for L&D policy, but, until now, there has not been an empirical research study to analyze expert opinions. Are existing frameworks to address climate change sufficient, or are new L&D-specific mechanisms needed? Some experts suggested that the UNFCCC should focus on improving mitigation and adaptation, rather than treating L&D as a separate challenge. Others emphasized the need for additional approaches to address the losses and damages that cannot be avoided, and climate changes which cannot be adapted to. A related question is whether L&D mechanisms should focus on minimizing negative consequences of climate change, or instead on addressing impacts that have already occurred and will inevitably occur in the future. Some experts put more emphasis on reducing risks, whereas others emphasized recovery, rehabilitation, and migration. Many experts agreed, though, that both challenges were important, highlighting the importance of integrated risk management, including risk reduction, risk retention, risk transfer, and recovery. What’s Climate Change Got To Do With It? When it comes to managing L&D, many of the practical interventions suggested – insurance, social safety nets, early warning systems – are familiar territory for disaster risk managers. So what’s new about addressing L&D from climate change? Human-induced climate change is modifying the frequency and intensity of extreme weather events, and causing slow onset changes such as sea-level rise and ocean acidification. The challenge of addressing L&D associated with weather and climate is amplified by anthropogenic climate change. But for any specific case of loss or damage, the influence of climate change interacts with natural climate variations, as well as the level of exposure and vulnerability to hazards. 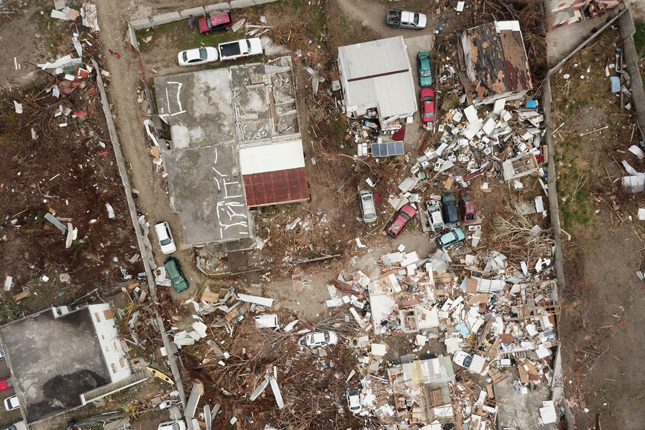 Hurricanes Harvey, Irma, and Maria are apt examples: Scientists can agree that more events of this magnitude can be expected in a warming climate. But the precise contribution of human-induced climate change to each disaster is harder to quantify, and the extent of L&D is also highly dependent on local factors, such as urban planning and emergency preparedness. This creates difficult questions about how to address L&D. Should L&D mechanisms under the UNFCCC deal only with L&D that can be directly related to climate change? Our interviewees had different answers. Some highlighted that the UNFCCC’s mandate is to address human-induced climate change, and therefore L&D mechanisms should focus only on that. Others, particularly practitioners, suggested that it would be more productive to work with existing disaster risk management and humanitarian efforts, to ensure that these incorporate the added risk from climate change. So It’s Not All About Finance? In short: no. Some interviewees did suggest that compensation will be needed, but they also highlighted that this was not the only – or even the most important – intervention to address L&D. They raised more fundamental questions about how to deal with irreversible losses from climate change. For example, if parts of small island states become uninhabitable, a payout might provide important financial support for the former residents, but it will not answer more challenging questions about where people should live or how to address their lost livelihoods. And that’s even before considering more intangible losses, such as loss of community, sovereignty, and mental health. In other words, the question “Who pays?” might obscure even more challenging questions about what to do with the money, and how to deal with losses that cannot be quantified. So what do these four distinct expert perspectives mean for progress to address L&D? The fact that countries have reached agreement on L&D – despite their different views – is an important achievement. However, given that the agreements are still quite vague, it remains to be seen what will be prioritized. Policymakers should be aware of these different perspectives, since if they are not reflected in actions to address L&D, negotiations could re-emerge. The good news for policymakers is that we did not find a simple split between those who seek compensation and those who wish to avoid paying compensation, so perhaps some aspects of the debate can be depoliticized. Our research might provide helpful background information for upcoming discussions, such as the 6th meeting of the Executive Committee to the WIM, which will take place in mid-October in Bonn, as well as the annual climate negotiations in November. Meanwhile, practitioners and researchers are already looking for ways to help understand and address L&D. We hope that by identifying four perspectives of L&D we can help them identify possible actions and research questions. The full paper published in Nature Climate Change,“A typology of loss and damage perspectives,” contains more detail and analysis of each of the four perspectives, including their implications for science, practice, and policy, and supported by key quotes from interviewees. A preliminary summary of key findings is also available in a policy brief. Rachel James is a research fellow at the Environmental Change Institute, University of Oxford, and visiting researcher at the Department of Oceanography, University of Cape Town. Richard Jones is a science fellow at the Met Office Hadley Centre and a visiting professor at the School of Geography and the Environment, University of Oxford. Emily Boyd is director of Lund University Centre for Sustainability Studies (LUCSUS), Sweden.